At the second panel of Transforming Transportation, panelists discussed the encouraging trends in sustainable transport and development that make mobility an important part of curbing greenhouse gas emissions. Photo by Mariana Gil/EMBARQ. Transforming Transportation (#TTDC15) is the annual conference co-organized by EMBARQ, the sustainable urban transport arm of the World Resources Institute’s (WRI) WRI Ross Center for Sustainable Cities, and the World Bank. This year’s conference focuses on Smart Cities for Shared Prosperity, and takes place on January 15 and 16, 2015 in Washington, DC. Join the conversation on social media with the hashtag #TTDC15, by following @EMBARQNetwork and @WBG_Transport on Twitter, and tune in to www.transformingtransportation.org for video streaming of select sessions. This is the question that needs to frame the debate around climate action, according to Rachel Kyte, Vice President and Special Envoy for Climate Change at the World Bank. Kyte took part in the second panel of Transforming Transportation 2015, in which speakers discussed how 2015 is a crucial year to embed sustainable urban mobility into the climate change agenda. Transport is responsible for 22% of energy-related greenhouse gas (GHG) emissions worldwide, and its emissions are increasing at a faster rate than any other sector. With the potential for a legally binding international climate agreement at COP 21 in Paris this December, panelists urged cities to adopt evidence-based actions to curb emissions through sustainable transport. In his keynote address, Felipe Calderón discussed how mitigating greenhouse gas emissions can go hand in hand with economic and social growth. Recent research from the Commission on Energy and Climate, which Calderón chairs, estimates that cities can save $3 trillion dollars by investing in low-carbon energy and prioritizing connected, compact, and coordinated development. “The next 15 years are a window of opportunity, and probably the last opportunity we have to design a new economic model to produce economic growth and address climate change.” Calderón said. He argues that this new economic model can also promote equity, in contrast with current growth patterns. Kevin Ausin and Vincent Kobesen described how transport and land-use planning are interdependent. As Austin stated: “You can’t have one without the other.” They describe that city governments are beginning to take a more unified approach towards these sectors. Alain Flausch argued that beyond using transit-oriented development (TOD) strategies, “We need to design cities where people don’t have to move.” Flausch argues that cities should use mixed-use development to ensure that people live close to their destinations, minimizing the strain on a city’s transport services. 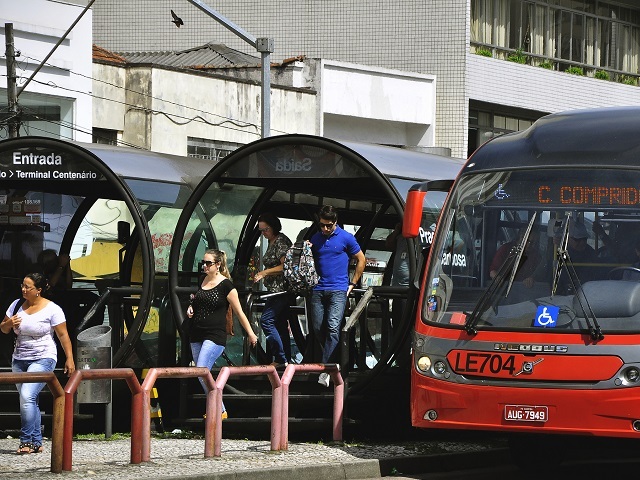 One of the principle challenges of using transport to create connected, sustainable cities is securing finance. Holger Dalkmann described that too much of the money globally invested in transport currently goes to expanding and building highways. There are encouraging trends occurring in sustainable transport that can help cities curb emissions. Cities are increasingly coming together to share knowledge and collaborate towards collective goals. Austin described that “cities can share in ways that nations can’t,” and Kyte agreed that “the most exciting trend for me is the real sharing of knowledge at scale among cities and among transport decision makers.” Austin remarks that bus rapid transit (BRT) used to take about 12 years to implement, but after learning lessons and sharing knowledge, cities can now do it in three or four years. As cities increasingly collaborate, they are also establishing a stronger commitment to measuring and reporting on their progress towards curbing emissions. Dalkmann described how 228 cities have signed the Compact of Mayors, committing to measuring and reporting city-level greenhouse gas emissions and collectively saving 13 gigatons of emissions by 2050. Stay tuned for continued coverage of Transforming Transportation later today on TheCityFix! 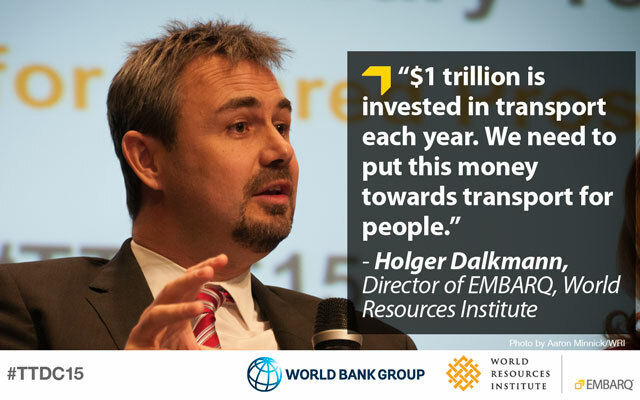 In the meantime, join the conversation online using hashtag #TTDC15 and by following @EMBARQNetwork and @WBG_Transport on Twitter. Live from Transforming Transportation: How can smart cities work with the sustainable development agenda?